Joakim Book | Life of an Econ Student: Are Swedish Tuitions Fees Actually Higher Than in England or Australia? Before we delve into the comparison between Sweden, Australia and England, let's look at some basic background to university finance. The entire idea with university education is that it pays off – not just socially, but economically – from the individual's point of view; via better jobs, higher lifetime earnings or lower risks of suffering unemployment (there's some dispute here, and insofar as it ever existed, the wage premium from a university degree has definitely shrunk over the last decades). The bottom line remains: if a university education increases your lifetime earnings and thus acts as an investment that yield individual benefits down the line, then we can appropriately and equitably finance that with loans. As an individual you have the financial means to pay back your loan with interest; as a lender, you have a market to earn money – neither of which is much different from, say, a small business borrowing money to invest and build-up his business. Another general reason – perhaps the most important reason – for why we wouldn't want to artificially price a service such as university education at 0 is strictly economical: it bumps up demand above what's economically-warranted. University educations are scarce economic goods with all the properties we're normally concerned about (has an opportunity cost in its use of rivalrous resources, with benefits accruying primarily to the individuals involved in the transaction), the use and distribution of which needs to be subject to the same market-test as every other good. The price mechanism has seen richer students actually having to make a choice about whether or not they should go to university. Although not nearly enough people say it, university is not for everyone. It is the price mechanism that confronts students, who perhaps would go to university to fulfil an expectation rather than for any wider economic or societal benefit, with a cost as well as a benefit to attending university. Prices serve a socially-beneficial purpose (doh), and that mechanism applies even in sectors people mistakenly believe to be "public" or "social", access to which should be "human rights" or similar nonsense. Now, to the core argument that university is probably more expensive in utopian Sweden than in England or Australia. The two models these three countries have set up look very different at first: in Sweden the government pays the tution and subsidies your studies; in England and Australia you have to take out debt in order to cover tuition fees. A cost is always bigger than no cost, so how can I claim the reverse? With the following provision: Australian and English students don't have to pay back their debts until they earn above a certain income level (UK: £17,775; Australia: $54,869). That is, those students whose yearly earnings never reach these levels, will have their university degree paid for by the government anyway. 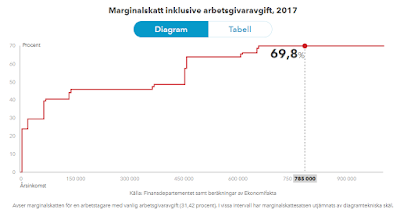 That means that the Scandinavian and Anglophone models are almost identical: no or low costs accrue for students today, in exchange for higher costs in the future once they have reached a certain level of income. Clearly, paying additional income taxes levied on high-income earners once I've benefitted from a government-paid university, but not if I never earn that much money (Sweden), or paying back my student debt only if my income reaches a certain level (England, Australia), amounts to the same thing. In this sense they are the same. In one way, the Aussie-English system is even better since it internalises costs to those who benefitted from the service rather than taxing everyone: it allows high-income earners who did not reach such financial success from going to university to avoid paying the general penalty-tax on high-incomes that Swedish high-performers do regardless if they attended university or not. To assess exactly where Swedish university students start paying back what the tuition costs that the government has covered for them, we would have to pick one of these thresholds and identify it as the 'University Threshold' in an absolutely arbitrary way. The fact that income-earners in Sweden face a much-elevated marginal tax schedule as well as the simplified calculations above do indicate that despite its level of tuition fees at 0, it is more expensive to attend university in Sweden than it is in England or Australia. Since Australia's pay-back threshold is so high relative to the income distribution of Sweden (78%), it's conceivably much cheaper for Australian students to attent university than for it is for Swedish students, even though the tuition list prices may differ. Although Littlewood's argument doesn't go far enough, he is clearly right that letting governments, via general taxation, completely fund universities is a regressive measure that probably hurts the poor even more than it helps the rich. The solution to this is not some quota-scholarships-encourage lower socioeconomic groups to attend-version but rather to a) increase and reinstate tuition fees where applicable, b) cut government funding to universities, and c) get government out of the sector entirely. That's a progressive policy in respect to universities. Accepting that, however, would be anathema for most people in politics, left and right. * not entirely true, since the ridiculously high payroll taxes of 31.42% as well as consumption taxes still apply. ** (Unadjusted for PPP – moreover, no account is taken for institutional differences between the countries impacting wage bargaining, gini-coefficients, various income inequalities or most importantly the financial study support/subsidies given to students in various countries.